Ridgefield Town Hall is located at 400 Main Street, Ridgefield CT 06877; phone: 203-431-2700. Photo: Lewis June House, ca. 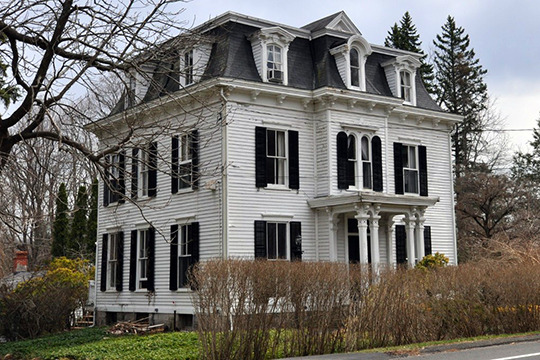 1865, 478 N. Salem Road, Ridgefield, CT. Listed on the National Register of Historic Places in 1984. Photographed by User:Magicpiano (own work), 2014, [cc-by-4.0 (creativecommons.org/licenses/by-sa/4.0/deed.en)], via Wikimedia Commons, accessed March, 2015. Settled from Norwalk and Milford in 1708, Ridgefield was recognized by the General Assembly the following year. As the name implies, the town is made up of high ridges, from which it is often possible to see Long Island Sound. Ridgefield has been a favorite spot for summer homes and in the early 20th century contained a large number of private estates with charming gardens and extensive views. The town supplied Connecticut with two governors: Phineas C. and George E. Lounsbury. Ridgefield is one of the main gateways from New York to Connecticut. After the burning of Danbury on April 26, 1777, General Tryon's force, harassed by the gathering militia, retreated to Ridgebury, in the northern section of Ridgefield.